Do you prefer CD-ROM to electronic download? We understand! 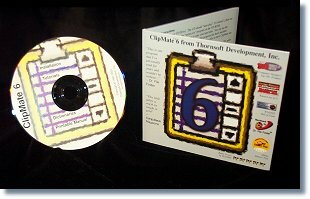 We've packed the ClipMate CD with just about everything that you will need. Additionally, with the inclusion of all of the online Viewlets, it it a great way to train people. Just pop in the CD, watch the Viewlets, read the manual, and install the software. The latest version of ClipMate 6. All spellchecking dictionaries from the AddictiveSoftware site. All Viewlets from our site. The user's manual in Adobe Acrobat (PDF) format. Note: There is no printed manual available for ClipMate 6. What you see above, is what is shipped. You can print a manual yourself, using the PDF (Adobe Acrobat 4) files on the CD. ClipMate wins "Best Application" at the 2007 Shareware Industry Awards. "Vastly changes the workings of a computer's clipboard."